Maretron's TMP100 measures the temperature for up to 6 temperature probes and reports the information over an NMEA 2000® network. The TMP100 supports up to 4 thermistor probes and 2 high temperature thermocouple probes. Optional thermistor probes (-20°C to 80°C or -4°F to 176°F) cover a wide range of applications including cabin air temperature, engine room air temperature, refrigerator/freezer temperature, under bolt temperature (inverters, charges, pumps, motors, etc. ), tank temperatures (live well bait, hot water, etc. ), and air duct temperatures. The optional thermocouple probes (0°C to 900°C or 32° to 1652°F) are used to measure Exhaust Gas Temperature (EGT) as part of a comprehensive fuel management system. Best of all, the TMP100 is NMEA 2000® certified so you can view any and all temperature information anywhere on the vessel using a compatible NMEA 2000® display. 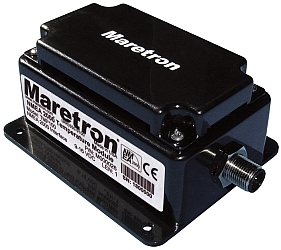 The TMP100 is a key component of Maretron's N2KView® vessel monitoring and control system.